MyToyStory :: Apps, Books, Reviews, Toys, iPad, iPhone and Parenting 2.0 » Blog Archive » Book Review: When Daddy Was a Little Boy, An introduction to Russian Literature. Although I’m one of the younger writers here and do not have any kids yet, I am fond of them. People tell us to imagine, to innovate, I feel that kids teach us that. 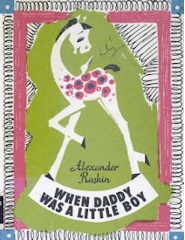 A big part of my childhood was reading, and one of my most cherished books of that time was this hardbound collection of stories called “When Daddy Was a Little Boy” by Alexander Raskin (originally in Russian, and translated into English). I received this as a gift and it introduced me to the wonderful world of Russian literature. This book is about a father who tells stories about his childhood to his young daughter. The stories are interesting, realistic and funny. They go from when Alexander Raskin was a little boy to when he was a young gentleman. They contain everyday scenes of his childhood – like when Alexander had been elected as his school newspaper editor or how he started writing poetry, or how he was late for school, or even chopped a snake into eight pieces, etc, etc, etc. Mischievous and instructive stories, they talk of the friendship, adventures, hilarious situations, family values. A must read.